Sen. Ginny Lyons briefs the Senate on a bill with provisions authorizing consideration of the purchase of hydropower dams on the Connecticut and Deerfield rivers. The Senate has approved the creation of the Vermont Hydroelectric Power Acquisition Working Group, with funding and a process to follow to research the potential purchase of a string of 13 power-producing dams on the Connecticut and Deerfield Rivers. TransCanada, owner of the dams, has put them on sale, along with a wind farm in Maine and three gas-powered plants in the Northeast, to raise money to help the Canadian energy giant buy a gas pipeline. The dam acquisition provisions were tacked on a bill addressing voter approval of municipal purchases of electricity. A telecommunications package also ended up on the electricity bill. The House hasn’t taken any testimony on purchasing the TransCanada dams, which suddenly became available in late March. Gov. Peter Shumlin set up a panel to quickly decide whether the legislature should take action before adjourning. The panel suggested that the legislature take the steps outlined in the bill the Senate passed. The bill would give a new, yet-to-be appointed working group up to $250,000 to hire experts to assist it in evaluating the feasibility of making a bid or finding a partner to join in bidding on the dams. 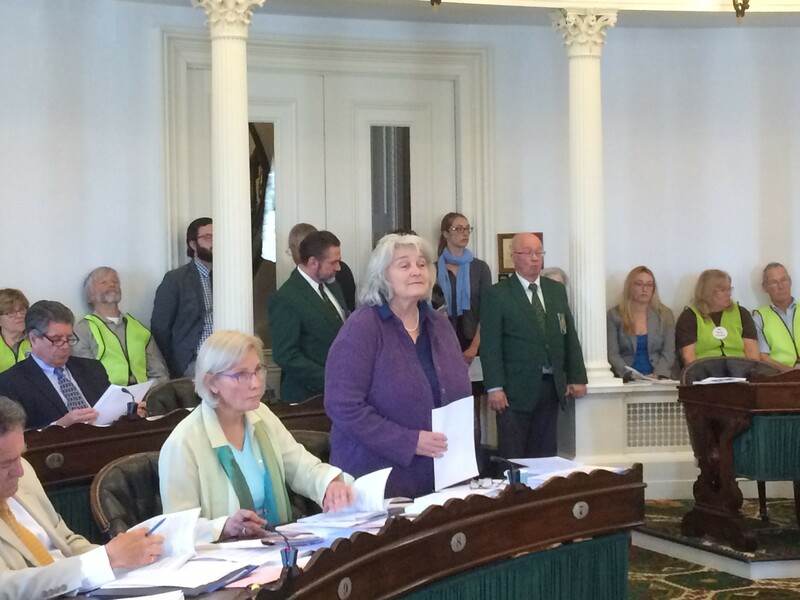 The working group would determine the condition of the dams and examine whether their energy production would be adequate to recoup purchasing costs, said Sen. Ginny Lyons (D-Chittenden). Lyons explained the proposal to the Senate before the vote. The bill requires that if the working group thinks the state should make a bid, it would ask the governor to call a special session of the legislature. Lyons said that any bid would be contingent on the approval of lawmakers. The bill also sets up a Vermont Hydroelectric Power Authority that Lyons said would become the “stand-alone manager of the dams” if they were acquired. The authority would go out of existence next January if the state hadn’t acquired the dams. House Minority Leader Don Turner (R-Milton) questioned whether the House would have time to give this new proposal proper consideration in the hours remaining before adjournment. “I hate to put more money out when we are already spending too much,” Turner said. House Speaker Shap Smith (D-Morristown) said he favors continuing to explore a purchase of the dams and will push for passage of the authorization provisions.